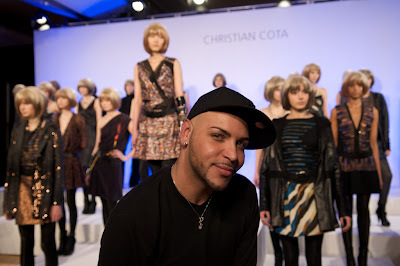 Christian Cota's Fall 2010 Collection was rich in blues greys and coppers, the key inspiration of hair and nails that were out of this world. Hair - Sultra's Creative Director Omar Lopez explained to me the inspiration for the hair as ombre with greys and coppers , the clothes color story was the "muse" for the hair color and he used the word "Cubism" as a description for the hair. The wigs that were hand dye-d by the oh so Fabulous Omar Lopez and his equally fabulous team, you can feel the love while they're working. 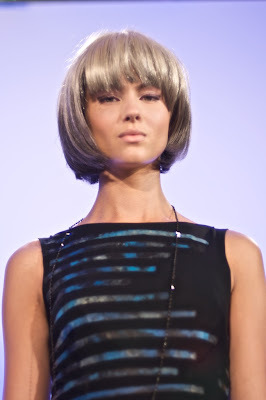 The wigs (originally) a shade of platinum were brightened even further to a higher platinum level , while keeping the Ombre theme in mind - half of the wigs were Ombre-fied with a brown (copper) while the other half was done in a blue-ish grey. 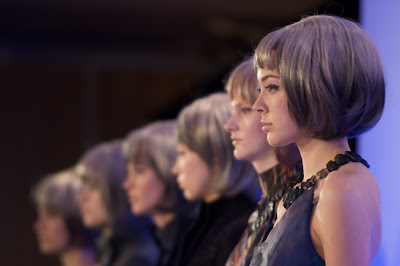 Another cool fact the models were given either brown or grey according to their ensemble, so the models had to give their names to the Sultra hair-team so that they were given the appropriate wig for their look. So Chic! Lopez wanted the hair to be a cross between the ultra pretty classic Bob and the anything but perfect rockstar Shag these wigs were styled somewhere in between. Omar wanted pretty hair but not the "hair is all in place - too perfectly styled " persuasion, the use of razors gave the ends movement and moved the style away from the " perfect Bob". Sultra of course were the products of choice, with complicated hand paint jobs on the hair, the Sophisticate Dryer ( used on the "fine" setting) was more than a saver. Omar mentioned the short amount of time it took to dry the wigs saved him and his "assembly line" as he affectionately called his team when describing the process. They went on to use the Seductress (trust me you will be one if you ever get your hands on one and style your hair) to iron the hair prior to cutting the hair. The wigs were feather razor-ed at the ends to shatter the line. The end result was a pretty/disheveled (who knew you could be both at once) work of art !!!! 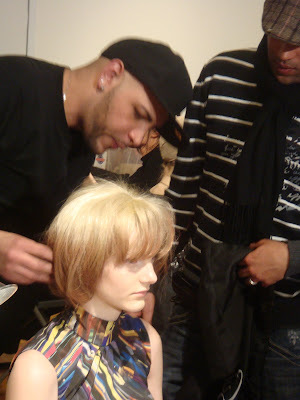 Here are some shots of Omar perfecting- those fabulous wigs !!! Getting that Wig TIGHT !!!! The end result - Ombrelicious !!!! Omar and his works of art !!!! Nails - Nail lead Patricia Yankee explained that the clothes were also the inspiration for the nails - which were press ons that were hand painted before hand in a blue/purple Ombre pattern. 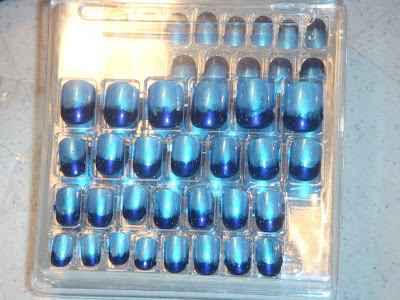 Patricia also mentioned to me that Christian did not want a short nail, he wanted a nail with some length - another reason to opt for the press on option. The nails were very beautiful , I wanted some for myself !!!!! !